Are you have problems to get windows to boot into safe mode? Have you tried both F8 and Shift+F8 and they don’t work? That’s probably because of all the changes Microsoft has made to the boot procedure in Windows 8 and 8.1. Windows has become so fast that it literally cannot be interrupted by any of your keypresses. But don’t worry, I have 4 ways for you to boot into Safe Mode. They don’t involve any special hacks or manual configuration. Safe Mode has been a component of the Windows operating system since the days of Windows 95. The basic idea is to allow the user (or technical support worker) access to the windows interface without loading any unnecessary drivers or software. The idea is that if device drivers or auto loading software (spyware, viruses) are causing problems with your Windows installation, the easiest way to fix things is to load a version of Windows that bypasses all but the most basic drivers and will not run any additional software. The safe mode provides you with a basic graphics driver (enough to display the user interface), access to your drives and windows configuration, and very little else. In Windows 8, the minimum screen resolution used by Safe Mode has risen from 800×600 pixels to 1024×768 pixels. The easyest way is to get into safe mode from a running Windows 8 pc. To do this, just follow the following steps. The images are just for illustrating purpose and your settings or screen may look different. Press the Power button at the Windows login screen or in the Settings charm. Then, press and hold the SHIFT key on your keyboard and click Restart. 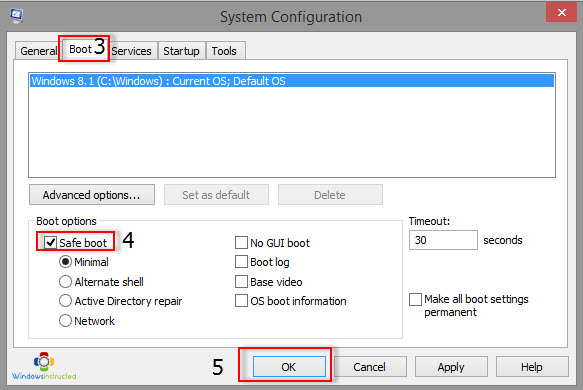 An other way to boot into the safe mode is by using the the System Configuration tool, also known as msconfig.exe. Check the box “Safe boot“. Now click or tap OK.
You are informed that you need to restart your computer. Click Restart or Exit without restart depending on whether you want to restart now or later. However, if your pc doesn’t include an SSD or if you are fast and lucky enough, you can always try to get into the safe mode by holding the Shift button and mashing the F8 key. This will sometimes get you intro the safe mode. In Windows 8 and Windows 8.1 you can use the Recovery Media Creator to create a system recovery drive on a USB flash Drive or a CD. If you created this recovery device, you can use it to get into safe mode. Just start up using the USB or CD you created. Then, the Choose an option screen is shown.